I grew up in Malaysia and every year, during spring break, my parents would pack us onto an airplane and our family would spend a week in Singapore. My parents had lots of friends there one of whom were my godparents. Whenever they would get together, all they would do is eat and shop, mostly Chinese food, but some of the time we would eat at hawker stalls. When I got older, I visited the hawker stalls more frequently and my favorite foods would be the popiah, Hokkien mee, Hainan chicken rice, curry laksa and sambal stingray. I remember while finishing up high school in Hong Kong, our senior class trip was to Singapore and Malaysia and I reveled in all the wonderful foods of my childhood when we all embarked on the hawker center for some locale fare. Since moving to the US a little over a decade ago, it’s been nothing short of a miracle trying to find authentic southeast Asian fare. These days if I’m craving something, I’ll either have to rely on friends to cook it, or slave away at the stove myself. When I heard about Chomp Chomp Nation a few months ago I was both intrigued and excited. A food truck serving Singaporean hawker food? I immediately started following them on Twitter and then on their second day out, I was on them like a hawk stalks its prey. Owners Shaun Ng, a native Singaporean, and his partner Robert Zuetell (with Robert’s wife Gina at the kitchen’s helm) run Chomp Chomp Nation. Their vision is to bring a taste of Singaporean street food to the people of southern California. The truck’s motto clearly states “Street hawker food with an American twist” and once I understood that concept, I think I enjoyed them better. I was expecting Singaporean hawker food and I think the first time, with those expectations, I was disappointed. To date, I’ve tried them on about five occasions and I’ve now sampled everything on the menu. Let’s start with the Sloppy Joe slider, a sandwich using rendang as its basis. This thick, rich, beef dish is seasoned with predominantly a mix of including galangal, lemongrass, chili, and coconut milk. I make this at home so I know exactly how much time and effort is put into it so I am hunbled that a truck can turn out rendang like this without the fittings of a complete kitchen. I like the flavor of the rendang although texturally, it isn’t what rendant should be, but then again, it’s an American twist on Singaporean food whereby the rendang is topped with Tiger slaw, a mix of carrots, cabbage, and Asian vegetables like daikon and papaya giving it a more eastern flavor. My absolute favorite on the truck are the satays. There are chicken, Wagyu beef, tofu satays and sometimes, they feature lamb satays on the specials board. The accompanying peanut sauce is very authentic! It is some of the best I’ve ever tasted! In fact, I could just eat this with the lontong (coconut rice cubes) they have. Honestly, hardly any southeast Asian restaurants in southern California serves lontong with their satays and these are something I associate satay with. In Malaysia, every order of satay is accompanied with lontong and frankly, it’s my favorite part, especially when the peanut sauce is as good as this one. Wagyu beef is tender, chicken is also good. 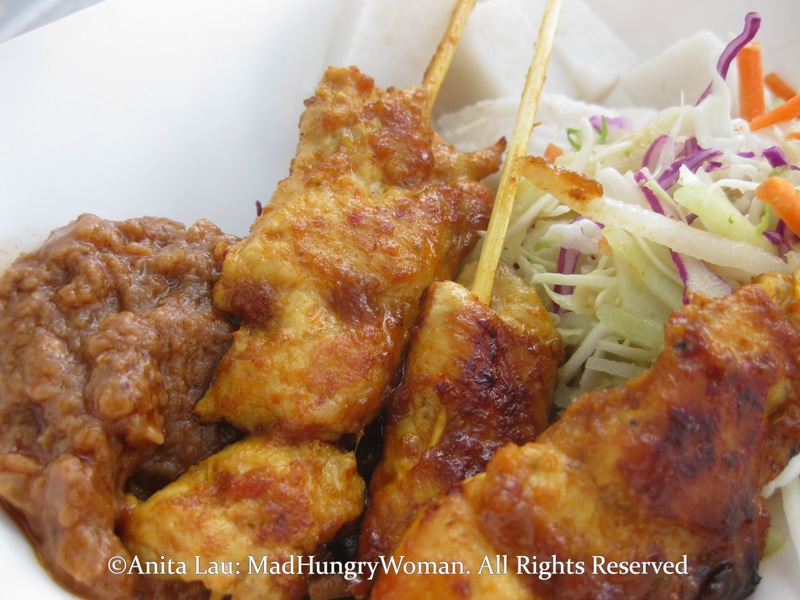 Vegetarians can enjoy tofu satays with that delicious peanut sauce. But that’s not all. Don’t leave without trying some of the desserts. Singapore S’mores uses nutella sandwiched between toast and drizzled with a coconut syrup and topped with coconut whipped cream. French toast Singaporean style is toast smothered with kaya, a coconut jam that is readily available in southeast Asia and as ubiquitous as Vegemite in Australia and maple syrup to pancakes here in north America. This sweet, gooey, coconut paste on toast, drizzled with condensed milk and served with fresh seasonal fruit is a twist on the breakfasts I remember my nanny would secretly slip me because my mother did not approve of it. My breakfasts were not as elaborate as this of course– I didn’t get any seasonal fruit on mine, just toast slathered with kaya. The truck is always adding new items to the menu and experimenting with different ways to make the same items. On my last visit, I enjoyed the lamb slider immensely! I think that is my new favorite for now, until that is, they add something else that tickles my fancy! Chomp Chomp Nation can be found on Facebook and Twitter. Oooh I have to be on the look out for this truck! Everything sounds so good I love Singaporean food.